After days of working on client projects and, even more exhausting, marketing my own writing, I decided I needed a break today. Although I couldn't tell it from inside my tight and at this point rather stuffy little house, the temperature had climbed into the low 60s. My dog and I had been suffering from cabin fever, and I was curious about whether signs of spring were popping up outside, so I roused myself out of my lethargy, grabbed the hiking pole, called the dog, and walked down to the ponds. Although I'd been down there just a few days ago, a close examination now revealed harbingers of spring that I hadn't noticed before. Spring was obviously underway already—not surprising considering how warm the winter has been generally. At the upper pond, while my dog sampled some delicacies left by passing wildlife, I examined the water for any signs of amphibian life. Although on warm days for the last couple of weeks, I'd seen some Water Striders that had been roused from their winter slumbers, that and a few small flying insects had been all I'd seen that maybe winter was on its way out. its being known as a Red Eft. Now, walking slowly around the pond, I noticed a flurry of activity—Red-spotted Newts (Notophthalmus viridescens viridescens) were starting off their spring breeding, although there was no sign yet of the jellylike clusters of eggs (resembling frog eggs) they'll soon produce. This species has long been a favorite herp of mine, because of its interesting life cycles—"one of the most complex and variable life cycles of any North American salamander," as the Virginia Dept. of Game and Inland Fisheries' Fish and Wildlife Information Service website puts it. That's because it has three life stages after hatching, rather than the usual two of most salamanders. It starts as a tadpole (aquatic larva), as most salamanders and frogs do, then emerges to live on land in upland forests. In this terrestrial stage, it takes on a bright red hue and is known as a Red Eft. The interesting part is that the salamander then returns to the water as an adult to mate and reproduce. a Red-spotted Newt, a predator, lurks below. I took this photo last August. Continuing my walk past the lower pond, which also had a lot of newt activity near the edge, I decided to explore the wetland beyond to see if Skunk Cabbage was finally coming up. I hadn't ventured over there since I moved onto the property last June, since I didn't realize the wetland was part of the property until I asked my landlords. I was glad to finally check out the boggy area, although it's drier than it should be this time of year. With little snow and not much rain either this winter, everything was drier down there than it should have been. Nevertheless, I found plenty of Skunk Cabbage already starting to bloom, which comes before the leaves appear. First blooms of Skunk Cabbage (top and middle) on Feb. 23. By later March, the leaves should create a green carpet (bottom, from last year in a different location). Coming back up the mountain, I found a black, woolly caterpillar in the yard (below). Looks like it belongs in the tiger-moth (Arctiidae) family, as the Woolly Bear (Isabella Tiger Moth) does, but without the orange banding that every school kid in Virginia would recognize. In fact, other than barely discernible lightening at the tips of the longer set of bristles, this guy is totally black. Looks like I need to whip on my deerstalker hat, for the game is afoot. First stop: BugGuide. I've already posted the photos there to see if I can get some help from fellow creepy-crawly lovers. Look for more on this in future posts. Black, woolly caterpillar, likely in the tiger moth family, like the Woolly Bear caterpillar (Isabella Tiger Moth). A few days ago, I had just finished my latest "Wild Ideas" newspaper column, about animals that breed in winter, in which I'd mentioned the American Woodcock (Scolopax minor). As if on cue, that evening I heard its characteristic slow courtship beeps outside my window, at the forest's edge. This species arrives here in the Blue Ridge to start courting as soon as the ground thaws enough that they can find their favorite food, earthworms. While this can be as early as January, they more typically show up in late February. 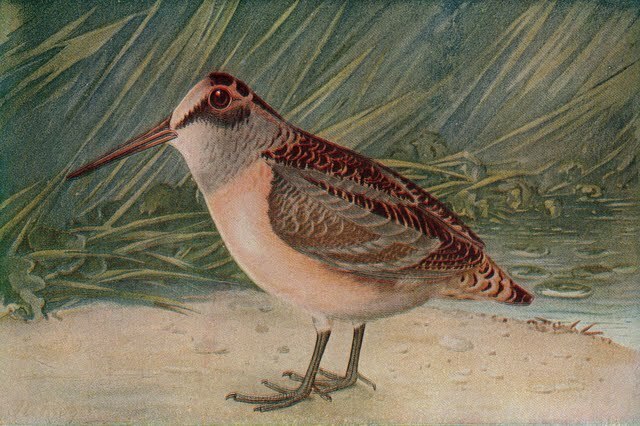 Belonging to the taxonomic order of shorebirds, S. minor evolved to live in upland forests and is the only woodcock native to North America. It ranges from Tex as east to Florida and north to southern Canada. Overwintering to the east of the Appalachians and south of Pennsylvania, it migrates west and north to breed. 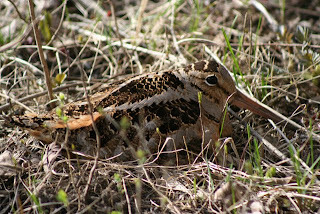 While the American Woodcock spends most of its life in young upland forest and brushy woods near rivers and streams, it prefers brushy clearings and meadow bogs scattered with woody plants one ot two feet high for breeding. Up around my house, it's mostly lawn and forest, with only a shallow edge, so I figured this guy was just checking out the neighborhood and would move on. This evening when I was walking the dog, I heard beeping down by the pond, a much more promising habitat for Woodcock romance. It's not exactly a meadow down there, but there are some scrubby areas that are broader than further up the mountain, and it's wet, with streams and ponds. In the dying light, I tried to remain quiet and make out the bizarre courtship display that should follow, but the bird must have figured out my dog and I were there, because he went silent. I'd just gotten home, it was time for my dog's dinner, and we still had to walk back up the mountain to the house, so I decided to try again some other night when I didn't have Mai Coh in tow. Woodcocks are famous for their courtship displays. Along with beeping, the males “spiral up high on twittering wings with melodius chirping and then circle back sharply to the ground to resume their unique peenting display,” as the Cornell Lab of Ornithology’s “Birds of North America” website describes it. Henry Marion Hall, in his 1946 book Woodcock Ways, describes the male’s descent a bit more poetically: “Descending, at first gradually but then plunging dizzily, the little musician eventually flickers into the brush….” The downward vertical spiral reminds me of a helicopter landing. Courtship displays also include bobbing, fanning the tail, raising the wings, and fluttering the wings in a short flight with legs dangling. Trying to discern all this in the growing dark is frustrating at best. The bird’s brown, black, and gray feathers, which makes it virtually impossible distinguish from its surroundings, doesn't help. Every time I try to see the show, I yearn for infrared binoculars. 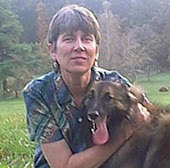 Living on the border of Shenandoah National Park, I discovered long ago that a great place to try to view this show is Big Meadows, a huge, boggy meadow that is a prime Woodcock mating area. Mostly, this has involved waiting patiently in what always seems to be a damp, chilly evening. While the displays have been carefully studied, they are not well understood. What is understood is that, after mating, the female is on her own in raising her young. Woodcocks feed in damp, muddy areas mostly on invertebrates, particularly earthworms, and on some vegetation, particularly seeds. On summer and winter evenings, they can flock together on their feeding grounds. With so little open area other than lawn on this property, it's unlikely I'll see flocks, but it would be nice to make out, in the dim light, at least one Woodcock giving it a try. 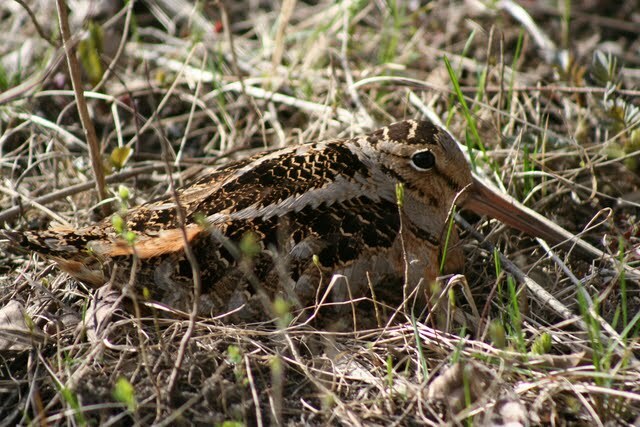 The Cornell Lab of Ornithology’s “All about Birds” website has recordings of the vocalizations of the American Woodcock, along with descriptions of its courtship behavior. Henry Marion Hall’s Woodcock Ways and the third volume of the Stokes Guide to Bird Behavior also detail the Woodcock’s courtship display and other behavior.